After Anacortes, things got busy. I had another show in two weeks, a smaller affair in Silverton, but also had pottery to make (shows coming up include Corvallis Fall Festival and Clay Fest) and graphic art work to do (ads for myself and Denise for the Holiday Market guidebook, plus posters and postcards for both Clay Fest and Clayfolk). My things-to-do lists have been brutal. 1. Silverton Fine Arts Festival. Silverton is one of my smaller shows, about on par with Roseburg. I started going there back when I couldn't get into the nearby--much larger--Salem Arts Festival for love nor money. I've kept going there because a) its a pleasant location, a wooded small-town park, with plenty of room between and behind booths for display and restock, b) it's close enough that we can commute (Not having to pay a motel room or a cat sitter are a big incentive to me. ), and, c) they treat the vendors really well. Friday night after load-in, they have a vendor/volunteer appreciation dinner. Saturday and Sunday, the vendor service center had doughnuts, scones, muffins, fresh fruit and orange juice. (Oh, and, what's that smelly black drink? Coffee.) At 11:30 they close for an hour to put out bread, condiments, three kinds of lunch meat, four kinds of cheese, sliced tomatoes and lettuce and cukes and pickles, pasta and potato salads. And six different kinds of cookies. We usually pack sandwiches, cookies, and fruit for lunch, graze the food vendors for supper, but at Silverton, we brought a little fruit--some from the nearby Farmer's Market--and relied on the show for the rest. 2. Making pottery. After Silverton, I was out of three patterns of coffee mug, five patterns of soup bowls, down to only two elephant and stegosaurus banks, and two covered casseroles (one large, one small). I really desperately needed to make pots, but had maybe 12 boxes of clay left, so I planned my throwing list carefully. Three (25 lb.) bags for soup bowls, one for toddlers. At least two each for pie plates and dessert plates, only one for dinner. Serving bowls, colanders, casseroles, canisters. Stick butter dishes. Elephant and Stego banks, tall mugs, tumblers, cream pitchers. At the end of two busy weeks throwing, I checked off everything on my throwing list, with less than half a bag to spare. I'm expecting delivery of another ton of clay sometime tomorrow, to get me through the holidays. 3. Graphics. Back before I became the famous and successful potter I am today (snort), I was a commercial artist. First at my alma mater, then at a 4-color printer in La Crosse. I quit to attend grad school in Eugene, but kept my hand in; my first Graduate Teaching Fellowship (GTF) was writing and producing the Art Department magazine, Artifact. Previous GTFs had typed out copy on an electric typewriter, but the department head was excited about the possibilities with the new desktop publishing software. Which I how I became a beta-tester for PageMaker 1.5. Over the years, I've kept my hand in, doing postcards for Denise and myself, as well as publicity for a bunch of clay shows. Currently, I'm poster or graphics chair for Ceramic Showcase, Clay Fest and Clayfolk. The latter two of which are in October and November, respectively, so this is a busy time at my desktop. The last few days of a firing cycle are busy. Glazing fifty to seventy-five pots a day, then loading, firing, unloading. Sorting and pricing and loading the van for my next sale. I get a little behind. The timing was tougher than usual too, this time. We usually load on Sunday, fire Monday, unload Wednesday, so I have Tuesday off, while the kiln cools, to catch up on chores, office work. This time we fired Friday, so my "day off" was spent at Saturday Market, and as the firing went 'til after 9 pm Friday, I was more than a little zonked. Add in the fact that the temperature hit 90° pretty much every day of the firing cycle, and you can see how things might get lost in the shuffle. So here's three snapshots to catch you up while I get ready to set up in Anacortes this evening. I took an order at Edmonds last June for something new: a covered pasta bowl. 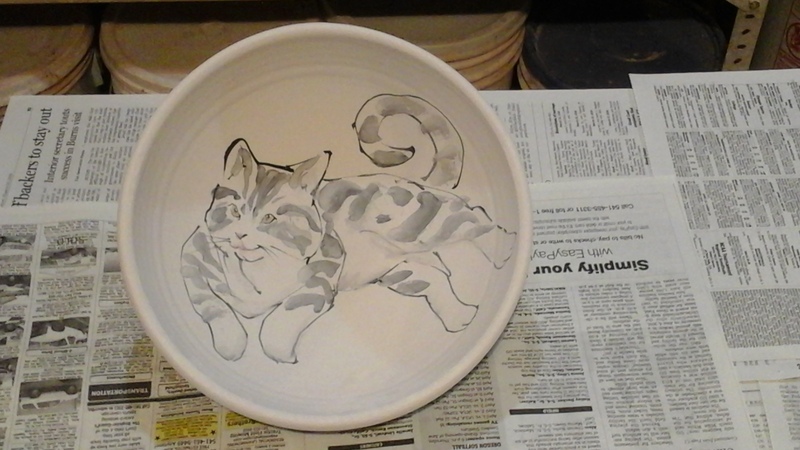 The customer wanted a fox pattern; I asked if I should paint it on the lid or in the bowl, and he said Why not both? Here it is ready to load into the kiln, looking lovely. Not show: How it looked half an hour later, after the know snagged on the roof of the kiln and broke off. Or the sound my heart made when that happened. It's theoretically possible to weld a broken knob on with glaze, but it's anything but certain whether it'll stay put in the firing. Safer to start from scratch, for my September firing. Oh, right, like you thought I could pass that one up... And anyway, I had to show off something from what turned out a very nice firing. Last job before I went in to pack for Anacortes : Water the garden and collect the produce. Clockwise from top left, we have: Mystery red apples, windfalls from the Lutheran Church lot next door; snow peas, var. Oregon Giant, from our garden; blackberries, growing wild over the carport, because it's Oregon; Blue Lake green beans from our new raised bed; Gravenstein apples from our tree; and tomatoes, mostly Sungold cherries, which are trying to take over the whole garden. If I had to choose one word to describe the UVAA Summer Arts Festival, it would be relaxed. Particularly as compared to Edmonds, last weekend. Where Edmonds has regimented load-in and -out, complete with legions of volunteers with walkie-talkies, Roseburg simply blocks off the curb lane of Harvard Avenue from 7 to 11 am for vendors to drive up and offload. We time it perfectly: at 7:30 we park immediately behind our booth space, unload everything, and I take the van off to the elementary school parking lot and walk back. Our space is mostly level, a minimal amount of shimming and blocking required, so set-up is fairly fast. Unlike most shows, they allow 11 feet square per booth space, with generous margins between, so we’re not bumping up against our neighbors, nor they us. We also have extra room behind the booth, so we can move our restock boxes back a bit, giving us some space to move around in. Weather is gorgeous, cool and grey during setup, but the sun comes out around one, the customers even earlier—we make our first sale at 12:30. Some years the heat can be brutal—several times over 100°—but this year it’s predicted in the low 80s, and we have a breeze through our booth most of the time. Sales are moderate to slow Friday, as expected, though I do sell both my. 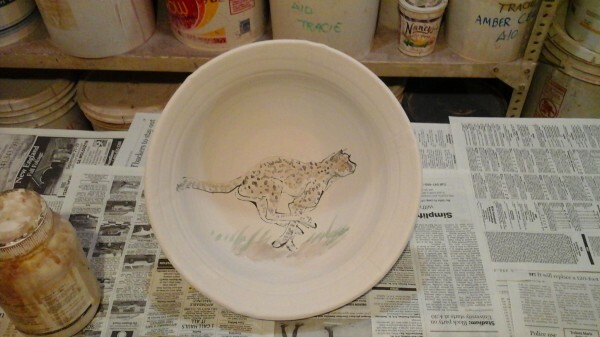 $70 serving bowls, which I hadn’t managed to do all last weekend. Saturday starts slow, and I go into my “I’m never selling anything again” funk, but things pick up in the afternoon, and we end up the day reasonably content. Days are long—Friday and Saturday we close at 8—but Sunday’s a short day. Load out starts at 4 pm. 1. 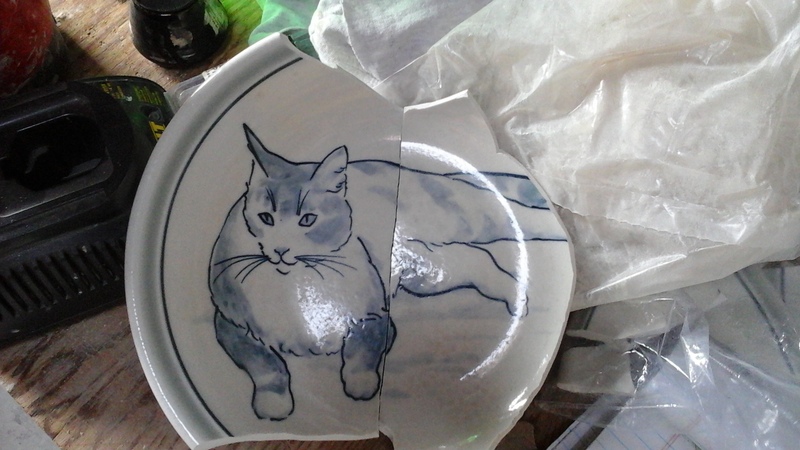 The customer who’s been buying a table setting a year for five years now (This year it’s a bear plate, bowl and mug). She’s apologetic about missing me last year, and I admit that I was gone too, back in Wisconsin for my 40 year high school reunion. 2. The family in to allow adolescent boy to pick a soup bowl to replace his favorite, sadly broken. While he’s deciding, I ask dad who autographed his straw hat; it turns out to be Asleep at the Wheel, when they played at the Stewart Park Band Shell. He’s the mandolinist for the local HotQua String Band, and we bond over my playing them on my radio show in years past. Incidentally, son Max eventually decides on a bear bowl. 3. The elephant keeper from Wildlife Safari who spends a long time in the booth before deciding to buy the happy baby elephant-patterned large pitcher. 1. The little girl, maybe three years old, who spun the wheel at the Edmonds Community College booth and won a prize, delightedly showing off her LED flashlight keychain to any and all passers-by. 2. Edmonds police patrol the festival, in pairs, in uniform, night stick, gun, the works. Then, in mid-afternoon, I see a solo officer, still in full fig, shopping with his wife while pushing the stroller containing their tiny, tiny baby. 3. The family of four--mom, dad, two boys about 8 and 6--who have a prolonged conversation, in Japanese, examining every pot in the booth featuring a crab or octopus, with both boys finding more options to point out. Younger son also has a teddy bear on his shirt, so Yuri (the bear in the icon, above) has an entertaining several minutes communicating in sign language (waving, dancing) before his parents settle on the octopus oval platter. Whereupon I hand him the bear to hold while I dig through boxes to find it and notice him puppeteering it back, waving at me. 1. Oh God, I don't have enough pots. 2. Oh God, I've got too many pots. 3. Whew! I've got plenty of pots, and in fact have a head start on the next firing. And I generally wind up with somewhere between six and a dozen ware boards of pots to stash in my space until next time. That's right. Two pots. One of them a refire. This is the closest I've ever come to a perfect load in all my years loading kilns. ETA: Okay, so I found a partial ware board in my space that never made it into the kiln room. Holding three more pots. Still pretty amazing, I think. ETA: …and done! Nothing else ran out. Last sale of the Market was an Octopus pasta bowl at 15 minutes 'til closing. Having two customers in a row who knew what potica was. (It's a Slovenian nut bread, served at holidays like Christmas and Easter.) Coincidentally, both of the were originally from Wisconsin, as are we. Selling our last yarn bowl to a lovely Polish woman, who said it was the perfect size and shape. Right after someone else had told me it was too small. A girl named Arden. Back in June, at Edmonds, we were visited by a little girl who loved our pots. I mean, it was like every time she noticed a new pattern, she'd squee, bounce a little, almost inflate a bit. I swear she was gonna float away if she saw one more bunny or kitty or elephant bowl. It was delightful. Sadly, she didn't have enough cash to get anything, and Mom wouldn't advance anything against her allowance. Later that day, I went down to my friend Shelly's booth to tell her the story, to find the same little girl there, equally enthusiastic about Shelly's animal sculptures. Fast forward six weeks. Late afternoon, I look up and say, "Edmonds." It's her and her mom. She's saved up her lawn-mowing money, and come to Anacortes looking for us. She found Shelly first, and bought a small elephant from her. Now she's trying to decide what she wants from me. Bunny toddler? Octopus dessert? Barn owl dinner plate? 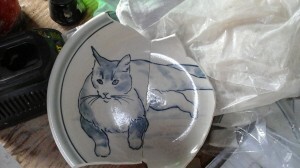 I'm going through the back stock box looking, for the barn owl dessert plate, when she finds the opossum dessert plate. That's it, we're done. She proudly paid out of her own pocket.